If you have read my two posts on the good/bad of the new FTC rules and the three ways the new FTC Guidelines impact Bloggers, then you have probably started to wonder about three common applications of these new disclosure guidelines. 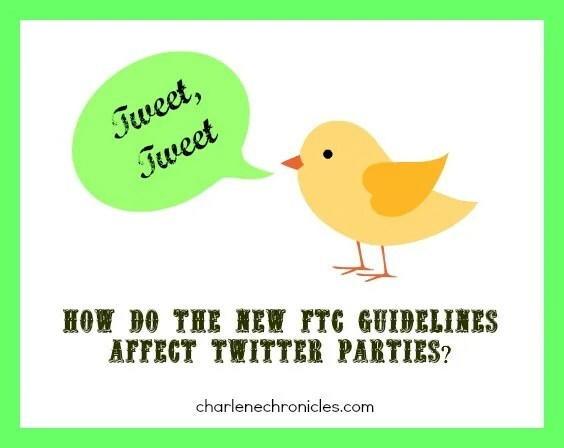 Mainly, your responsibility when retweeting, hosting a Twitter Party or Pinning on Pinterest as part of a review. It has long been said that you may be liable for a retweet. So, it goes to say that if you retweet my “Ad” tweet, you need to make sure the “Ad” part doesn’t get left off. Otherwise, you have just shared (and some would say, endorsed) with your followers a paid “advertisement” (according to the FTC) without disclosing it was an “Ad” or a sponsored tweet/post. The same logic can apply to a Twitter Party. I’ve been thinking a lot about this. I have come to the conclusion that if you are getting paid to host a Twitter Party, and thus promote the brand/product/service, how is it any different than getting paid for a promotional one-time tweet. Or tweeting a link to your blog post that is promoting a brand, product or service. I’m not seeing much difference, though I would love to hear thoughts on the contrary. Lastly, a lot of brands have sponsored campaigns where they ask Bloggers to Pin on Pinterest. If you are getting paid to Pin, and thus ‘enticing me’ to visit your paid post or brand page with that pin, you must disclose you got paid to pin. Similar to me getting paid to post and having to disclose the payment in the post. If your pin is just an extension of your sponsored blog post, and you created a pretty pinable image on your own, you still need to disclose, as it still entices me to click to your site. It is similar to me tweeting about my paid post: the FTC requires me to clearly disclose that my link or tweet is sponsored. 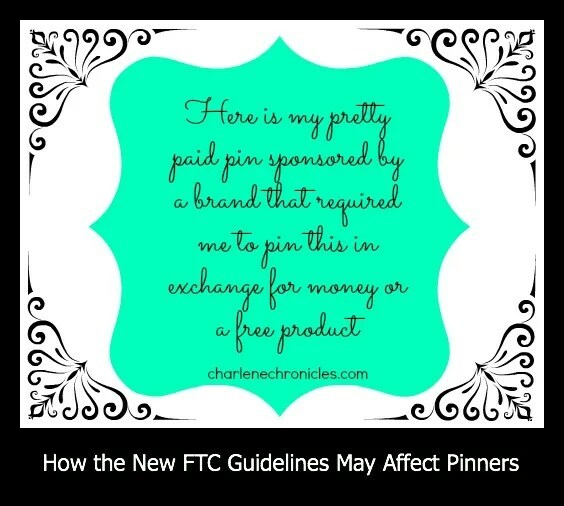 While not specifically stated, but implied, the FTC requires you to clearly disclose, in similar logic, that your pin or pin link is sponsored. This is new ground people, and every person (attorney or not) is going to have an opinion on the application of these FTC guidelines. Guidelines are guidelines. They help explain a rule. In this case, the FTC Rules on Digital Advertising. Yet, rules are often fully explained when a supposed violation of them (e.g. you and your blog) goes to court and the courts start dictating what all of this means. While I am an attorney, I am not your attorney. Nothing in this post shall be construed as giving, offering or providing legal advice, legal review or legal analysis. You should contact an attorney with assistance in understanding the FTC Rules and how it applies to your blog. Note, this is brand new information that is still being processed by a lot of people. It is unclear if you have to go back to amend posts. Even I am learning about the scope of the changes every day and will continue to update my blog and social media extensions as the information becomes known, shared and understood. This is SO confusing to me. I get disclosures in posts. I get that when being PAID to tweet, post, or Pin something you should say that you were paid. However, I don’t get how it is even plausible that go to an event for free, write a disclaimer, then have to add “#ad” to tweets/fb posts just linking to our content (content that has the disclaimer). Does this also mean that we need to edit every image to include “Sponsored Post” if we attend an event for free and have our images pinnable? I want to abide by the rules… but, it is really confusing. Thank you for your post. Jenni. Great questions. When I wrote this post, it was just an educated guess but recently Nordstrom got slapped by the FTC for a free event they hosted for bloggers. However, it wasn’t really ‘free’ in the eyes of the FTC because the bloggers got food and a goody bag to take home, and the Bloggers tweeted during the event. So if your are getting some sort of compensation – even if a just a ‘meal’ vs. cash – you need to use some sort of language in a tweet that you tweet out (vs. a retweet).